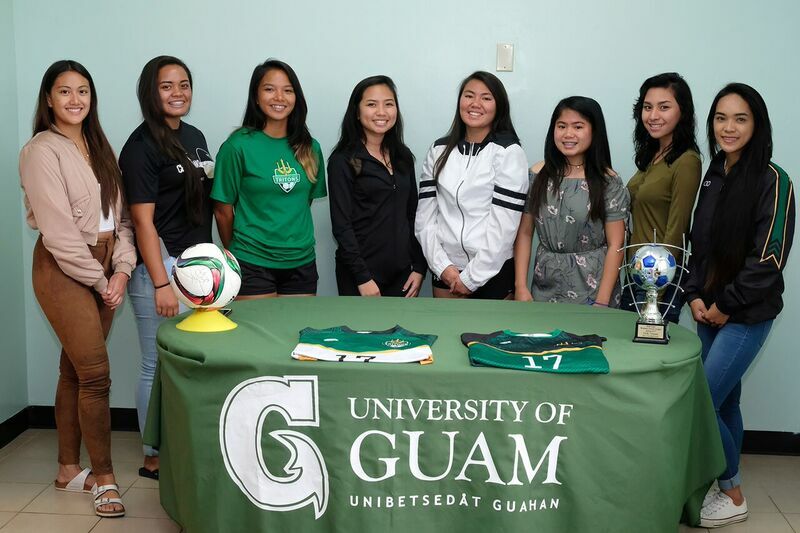 PRESS RELEASE – The University of Guam Women’s Soccer Team signed eight returners from the 2016-17 Guam Football Association Women’s League (Division II) Spring Champions to Athletic Letters of Intent and partial tuition scholarships to play for the Lady Tritons in 2017-18. Aiyana Shedd – Played high school soccer at the Academy of Our Lady and won a Junior Achievement award in 2015 while attending the Academy. Aiyana was a “Green Club” member of the UOG Athletic Academic Clubs (3.50 GPA to 3.99 GPA) in 2016-17. Koholali’i Maertens – Attended Hilo High School in Hawaii all of her high school years. She was captain of her high school soccer team as a senior. Koholali’i was named 2nd Team All-Island as a freshman through her junior season and was 1st Team All-Island as a senior. Her high school team won the State Championship when she was a freshman and Hilo went to the state playoffs all four years Ms. Maertens played. She was a Key Club (an academic club) from her 7th grade year until she was a junior. Koholai’i was a track star at Hilo High School as well, winning the state 400 meter dash as a junior and 4X4 Relay and 4X1 too. Hilo was state track champions during her junior and senior years. She also won the state discus throw her senior year. Elisha Benavente – Played high school soccer at Harvest Christian Academy where she was captain of the team as a senior and was 2nd Team All Island as a junior. She was an A/B Honor Roll student during her junior and senior years and was captain of the girl’s basketball team as a junior and senior. Elisha scored both goals in UOG’s 2-1 win over Select Care/ISC Team Slay in the Championship Match of the Guam Football Association’s Women’s League (D2). Aiesha Castro – Played for George Washington High School where she was named 2nd Team All Island as a senior and on the All-Defensive Team. She was on the winning team for the All-Island All-Star game as a senior as well. George Washington finished in the Top Four teams on the island each year of her high school career and GW won the 2014 and 2016 Pre-Season Tournament for the Guam Football Association. She was an Honor Roll student from her freshman year through her senior year. Philana Lopez – Played for St. Paul’s Christian School where she was captain of the team from her sophomore season through her senior year. As a senior she was named Honorable Mention All-Island. She won two championships as a club team member of Quality Distributors Women’s Team. In high school Philana was a National Honor Roll Society of Scholars member. Lopez was also a member of the Guam National Team as a U13 and U14 player. Shaeina Torres – Played at Simon Sanchez High School where they finished 3rd on the island as a senior. Torres won multiple championships in the Robbie Webber League playing for several club teams to include the Crushers, Islanders and Dededo Soccer. She was named captain of the girl’s basketball team at Simon Sanches from her freshman year until her senior season. Shaeina has been a Regent Scholar for every semester she has attended UOG and was a member of the Triton Athletic Academic Clubs as a “Triton” (4.00 GPA Club). She was voted the Most Valuable Player on the UOG Women’s Soccer Team in 2016-17 and was named the “Student-Athlete of the Year” at UOG for 2016-17. Adrianne Flores – Played high school soccer at St. Paul Christian School as both a middle schooler and in high school. Played for the Islanders club team as a youth and was the Junior Golf Club Champion. She was a Honor Roll member in high school and also played volleyball and golf at St. Paul. Ashley Borja – Attended the Academy of Our Lady for high school and was a member of the Quality Mom’s club team and the Southern Cobras. She was a Dean’s List student in 2014 and Psych Club Officer. She was a Unity and Diversity Award recipient and was a Triton Athletics Academic Club member at the “Green Club” level (3.50 GPA to 3.99 GPA). Ashley was also captain of the Academy’s softball team and finished 3rd in softball on the island as a junior and senior. The Lady Tritons were 4-2-0 last spring season when they won the GFA Women’s League (D2) Championship and went 6-0-0 playing in the GFA Women’s 7 On 7 League during the Fall of 2016.